To start things off, I haven’t posted in a while and I’ve actually missed it quite a lot, so I’m really glad to have a couple things lined up to shoot and to post. 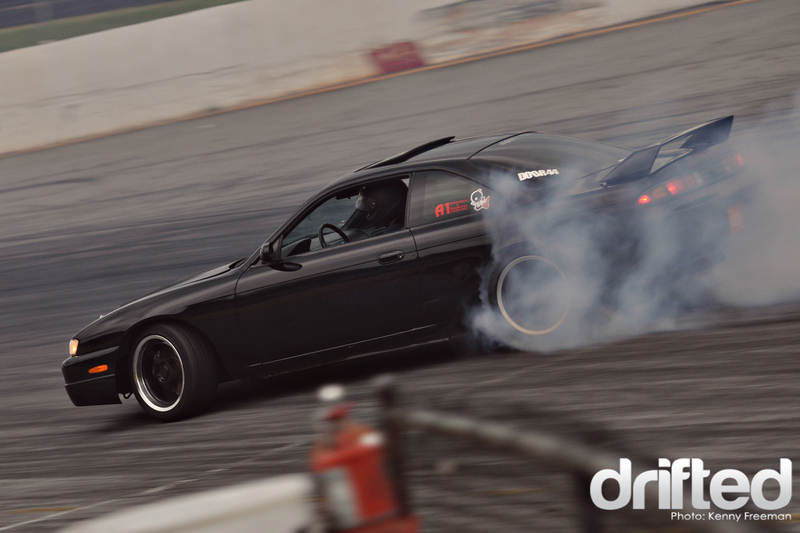 We recently received news that sadly, all the local Atlanta drift events were to be cancelled for the year. This was bad as I didn’t know what I was going to be able to shoot! Luckily, it was announced that there was going to be a practice event at Lanier National Speedway and what a deal it was. 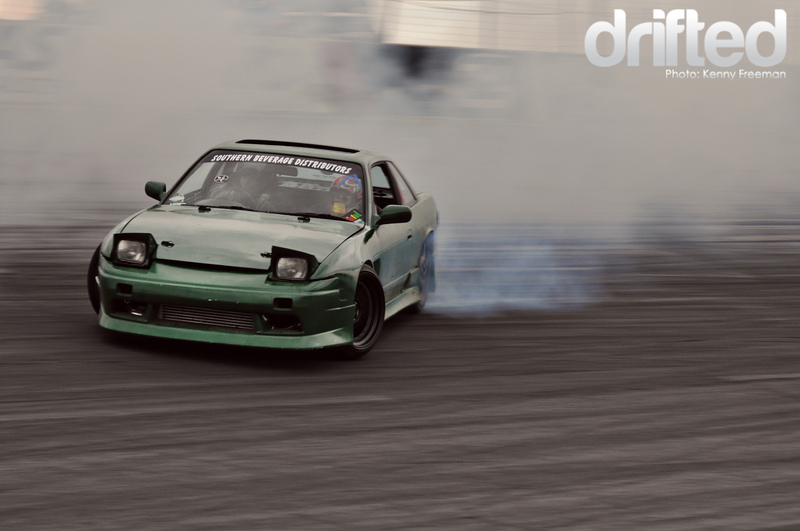 From guys out drifting for the first time, to guys that have been out for years, there was plenty of action to go around. The talent was here all night, and so was the smoke. Guys like George Grob were tearing it up on the bank, coming in high and staying high, with a huge line of rubber to follow. 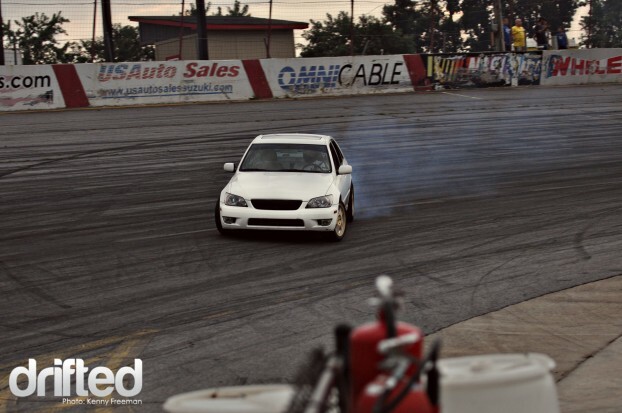 The first time I saw him on the track he lit it up and didn’t come off until his car started to overheat. After stepping out of the car, the first words out of his mouth were “I need more smoke”. I looked around the track to see clouds of smoke still in the air from his last run. He had plenty! 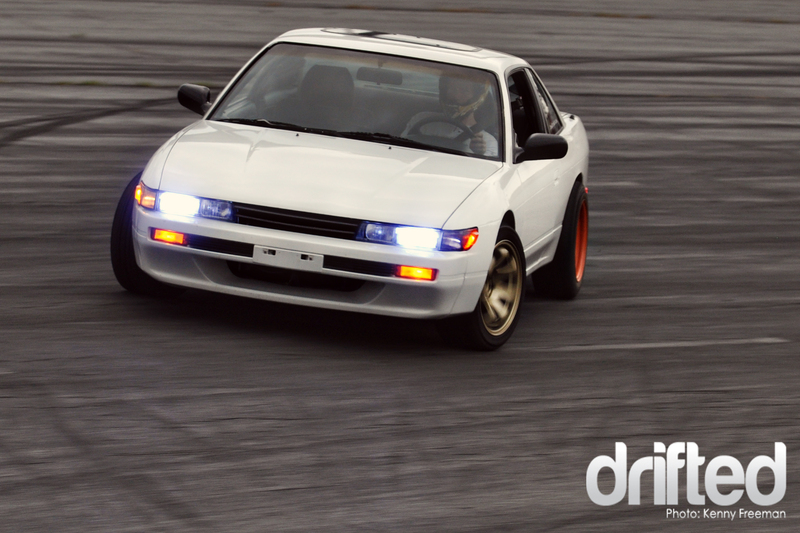 This sweet street-style S13 was going well all day. I’m pretty sure thats George Grob’s smoke screen still lingering behind him! 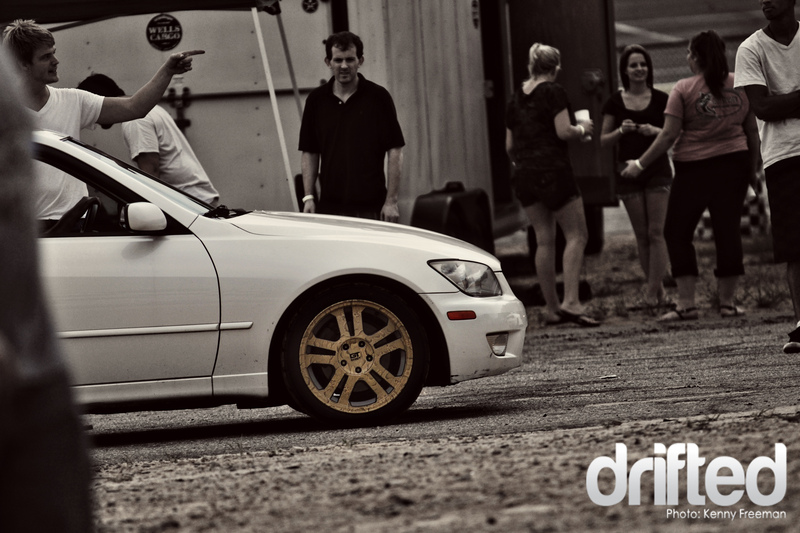 Controlled, stunning, graceful, are all words that can be used to describe Jonathan Stancel and his IS300. It wasn’t until Sunday when we all met up for some more practice at another location that I realized how good this guy really was. At first glance you notice the crazy wrapped wheels and cleanliness of the car, but once he was out on track doing what he did best, that’s when you see the true beauty of this car. It looks effortless to get as close to the wall as he could, yet keeping full control of every inch of his car. This guy knows how to have a good time, and by the sounds of things from hearing him talk, it looks like he has only just begun. 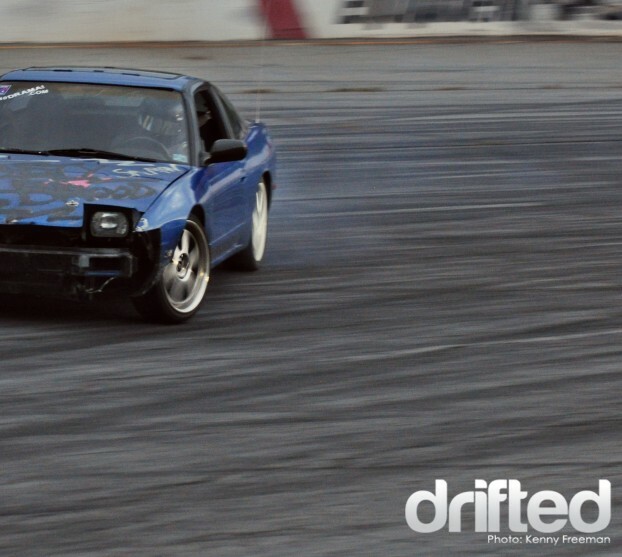 After waiting 3 hours to get 2 tires mounted, pushing his way through Atlanta rush hour traffic, and driving for 3 hours, David seemed to still be able to have some fun out there in his blue 240sx. I mean isn’t that what it is all about anyway? 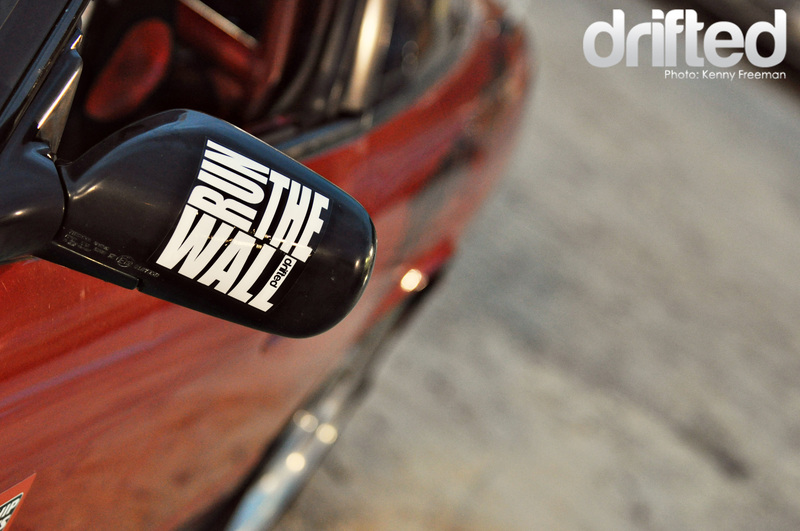 The thrill, speed and smoke? 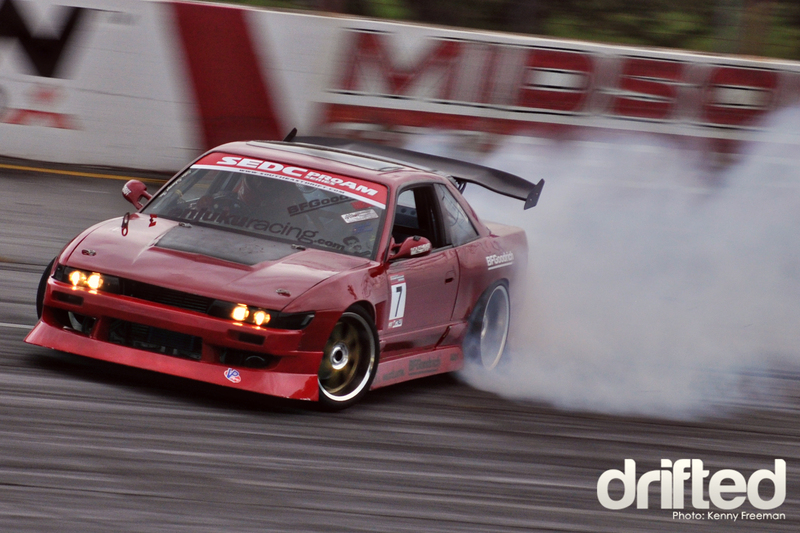 David was putting in some solid runs until it was time for the Pro Am guys to go out and enjoy the track. The shot above was his last full run in this car. Unfortunately in his next run he slid into a wall and tore his car up pretty bad. Down but not out, he is currently working with friends on getting up and running again. Hopefully he will be back out sliding again very soon. Look out for David in future posts of mine. 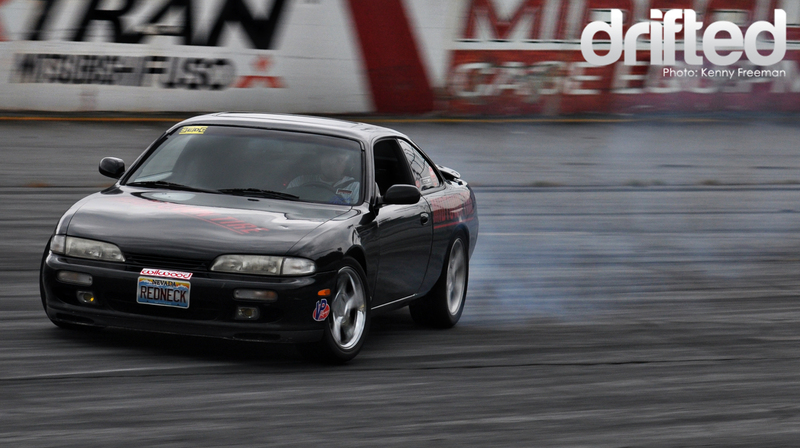 Above, a sweet black Kouki S14 lights them up coming down off the bank. Lanier Speedway allows the drivers a taste of drifting a fast banked oval, as commonly found in pro level drifting. Who knows, maybe one day you’ll see some of the Atlanta locals battling with the D-Macs and Fousts of Formula D.
Despite the license plate, this Zenki S14 isn’t exactly what I’d class as a ‘redneck’ drift car. Above he dials in the angle on the bank. Harrison Ritchie’s Lexus would also have it’s last few runs here on this track. The following day he took another trip up to practice and also totalled his car. On the Friday night, Harrison was driving with pure ‘no lift’ determination, linking the full course and manjiing down the straight aways. Not bad for an auto! Harrison, with the help of his team mates in team ‘Ginger Beard’, will also be back, and I for one cant wait to see him back out there because this guy puts on an show. 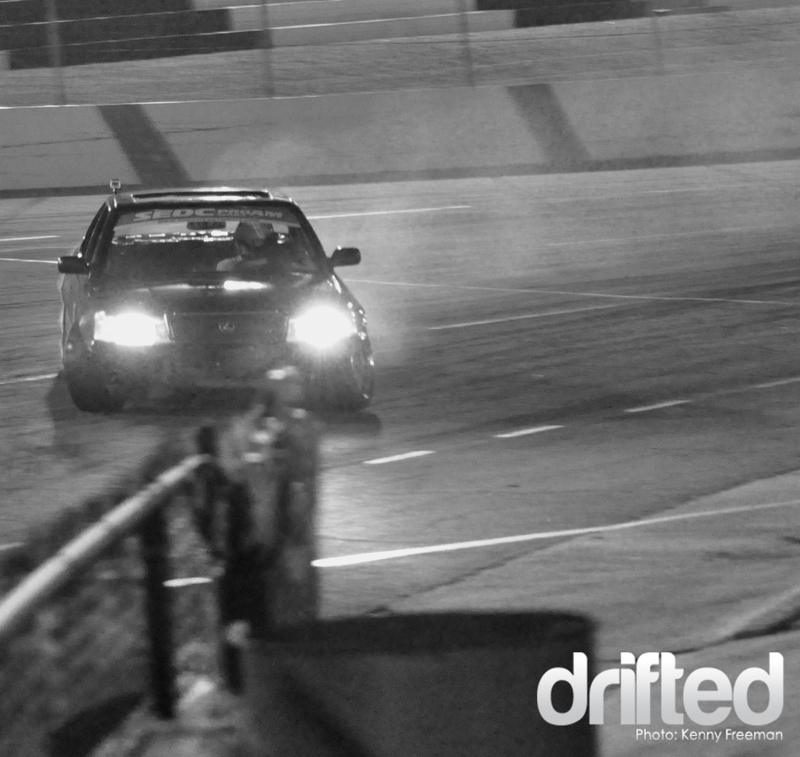 Not a good night for Atlanta’s drift car population but an awesome night to have drifting back in Atlanta!